More than ten and a half million tourists visit Gibraltar every year. A large number of them will avoid its neighbour across the border, one of the famously infamous towns in Spain – La Linea de Concepción. Believe it or not, this drug kingdom of Europe is both charming and welcoming. The town bordering with Gibraltar also offers several nice restaurants like Revuelo or La Chimenea. If you travel to Gibraltar, you should try to find an evening for yourself to cross the border and grab a table at one of the best restaurants in La Linea. I am not a tourist. I am an immigrant who came to work in Gibraltar and who stayed living in sunny Spain to escape the daily routine. It’s not easy. La Linea is not a very big place and the stories about the ghetto life you read in newspapers are just… true. On the other hand, Andalusian people love dining out and people from La Linea – which in some ways is like a perfect picture of life in southern Spain – adore it too. There are not all that many places worth a visit but at the same time there are definitely some great places to choose from. How is the food in La Linea in general? Spanish, or let’s say Andalusian, people especially enjoy their own cuisine. You will find here more tapas bars with quick service and busy crowds standing around their tables than proper sit & dine restaurants in La Linea. When I first came here I was quite surprised to realise just how greasy the Andalusian food is. In my opinion, at least 75% of the dishes served are fried or flooded in oil. They also serve patatas fritas (French fries) with almost every dish. Mayo is the king of sauces. It’s served so often and with so many different dishes that on the rare occasion you don’t get it you think there’s something wrong. After two and a half years living in La Linea I obviously haven’t visited every single place there but I have definitely found my favourites. Please understand that this is a personal list and the popularity of restaurants can vary from person to person. I usually dine with my boyfriend and he’s the picky one so when he likes a place it has to be good. And these are his favourite places too. If the list is not enough for you then scroll down to the last paragraph where I enclosed restaurants popular amongst my friends and colleagues. Almejas al vapor served Revuelo Taberna, La Linea are juicy and rich in flavour. One of the best restaurants in La Linea, and for me at the moment the number one restaurant, is Revuelo. It’s located between Bodebar and Telepizza at Calle Cadalso, 6. It is not a typical Andalusian tapas bar even if it does offer some Andalusian dishes from time to time. The owner is half Galician and he decided to bring a touch of Galicia to La Linea. It was a good idea, because the food is delicious. The owners who run the restaurant are also both waiters and chefs there and they provide the best dining experience in La Linea. They are incredibly friendly, always smiling, always giving you suggestions and most importantly, they cook with love. Don’t try to discourage yourselves with the at-first-sight humble menu. This place is about feeding you with the freshest food possible. That’s why it operates special menus; the owners basically buy some fresh stuff and they decide what to cook the day before or even hours before they open. It’s mostly seafood and meat but the great thing about this restaurant \ tapas bar is that if you reserve a table in advance and ask for a vegan friendly menu, the owners will be more than pleased to prepare it for you. Everything that I’ve tasted there so far has been stunningly delicious. You can’t leave the place without a big smile on your face. After eating at Revuelo we’re always so happy. My favourite dishes are almejas al vapor which are clams with lemon sauce. 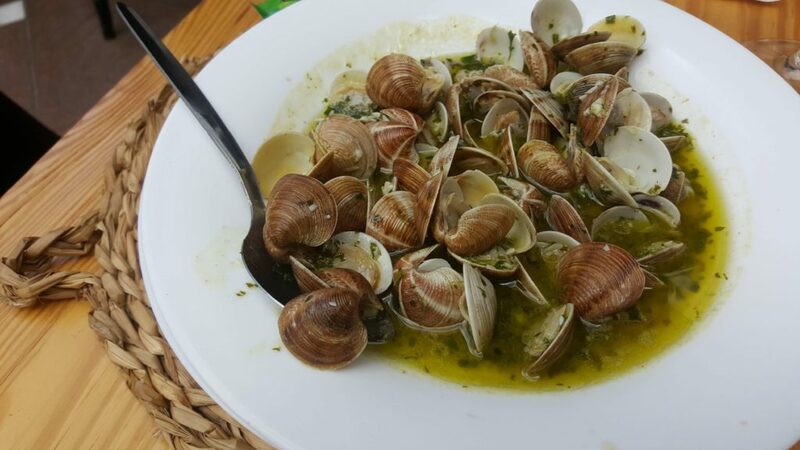 I’ve tried seafood many times, either here in Andalusia or in Italy, Hamburg, Bristol… all places surrounded by the sea – but I’ve never had better clams in my life. They are so soft, fresh, rich in taste, swimming in a garlic lemon sauce so intense and tasty that you have to ask for an extra piece of bread. Leaving the sauce untouched is a culinary sin. If you like Gambas Pil Pil (prawns or king prawns roasted in olive oil with crunchy roasted chillies and garlic), go to Revuelo. While the place is quite small you have the unique experience of smelling the fresh scents of your food even before it arrives to your table. I have to repeat myself again, they are so fresh and soft, basically like sea melting in your mouth. The best in town, and the best I’ve ever eaten so far. All the meat dishes include high quality local meat and are cooked on the spot and served with home-made fries, Tomates Aliñados (fresh and raw tomatoes with salt, olive oil, garlic, parsley or other herbs like oregano or thyme, vinegar, lemon, sometimes black pepper), or Pimientos de Padrón (fresh small peppers roasted on a high heat in olive oil, relish with sea salt). Ask for the daily special to get the cut of the day. They usually have entrecôte or sirloin. 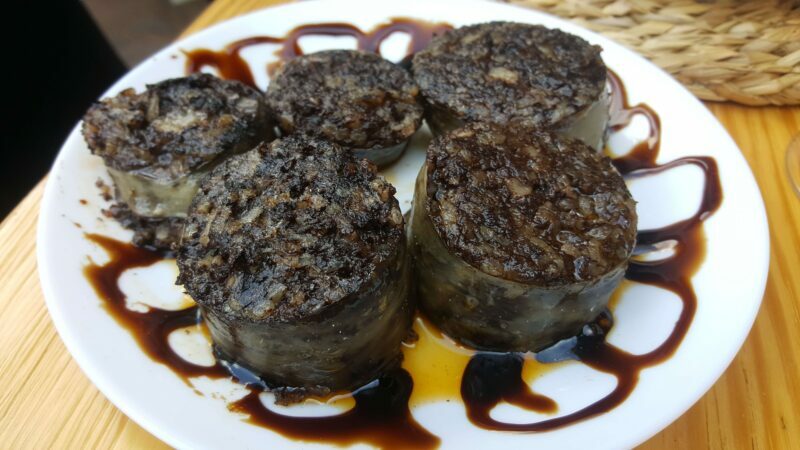 Another super yummy dish we’ve had is Morcilla de Burgos (black pudding) served with Pedro Ximenes sauce, which is also accompanied with homemade Croquettas de Jamón. Once again, the best in town, in my humble opinion and in the opinion of my boyfriend. You won’t make go wrong by having some Galician cheese or cold mussels as a starter. Another big plus is the wine! You can find here a wide selection of local red or white wines, sometimes wines from Galicia. Now to end my ode to Revuelo: it’s basically a perfect place to go whether you’re visiting, staying or living in La Linea de la Concepcion. This tapas bar is the best one in town for many locals and La Linea immigrants (or let’s say expats). I totally agree with them, but Revuelo is just my current number one eating place in LA. It’s a classical Andalusian tapas place with an open grill kitchen, bar, several small tables inside and a few seats outside. As with many of the best restaurants in La Linea, La Chimenea is usually packed so you’d better go there a few minutes before they open at 8:30pm. The tapas in La Chimenea is really a tapas. Not like in many other bars where you order a tapas which is as big as a half portion of a main meal dish and then you’re absolutely stuffed. Also, usually the smaller the tapas is, the better it is. La Chimenea offers a long list of various canapé and montaditos. Our favourite is the mascarpone one with fig jam on top, or the one with goats cheese, walnuts and honey. There are so many types of canapés that everyone should be able to find his or her favourite combination. They’re definitely some of the best ones in whole La Linea. I can’t really say they’re the best ones, only because other tapas places have set the bar of the canapé competition quite high. One of the specialities of La Chimenea is Rosca, which is a ring-shaped bread filled with jamón and cheese – something like a huge bagel. Don’t eat it alone, Rosca has to be shared. If I remember correctly there are 2 types of Rosca in La Chimenea. I’ve never seen it elsewhere and so have never eaten Rosca in any other restaurant in La Linea. Apart from the previously mentioned, carnivores can enjoy some hot or cold cut of meats and cheese lovers have plenty of cheese dishes to select from. They have also many daily specials if the long montadito, canapés and tapa menu is not enough for you. You’ll either hate it or love it! A fast food tapas place made in La Linea is definitely not a Michelin star nominee with exquisitely crafted dishes. It really is a fast food place, where you come, grab a table, order your food and get it within 5 minutes. Then you give it a bite and the food is bloody hot. I don’t really know how the guys in the kitchen do it but it’s some kind of Andalusian miracle. Casa Puri, localised at Calle del Sol 44, specialize in montaditos and canapés. Let’s talk about these two beauties for now. Montadito is a bun filled with typical Spanish delicatessens such as lomo (which is tenderloin cut), or jamón (you probably know what that is, just to give you some hint – it’s like Italian prosciutto, pork ham…yum), cheese and sauce. Canapé is a slice of a very thin bread topped with several ingrediencies, usually much crazier or more creative than montaditos. You can get seafood canapés, meat canapés, cheese canapés with nuts, or all of these mixed together. When we get to Casa Puri we’re quite boring. We always go for the same stuff, montadito Francis which is lomo with mojo picón sauce (spicy pepper & paprika & mayo sauce) or montadito Jony which is again lomo de cerdo (pork tenderloin) with jamón, raw tomato, manchego cheese and gaucha sauce (a sauce served mostly with meat, it contains oil, tomatoes, garlic, sugar, vinegar, eggs etc., basically something like garlicky and tomato mayo). From canapés we love Currito with Philadelphia cheese and cubes of jamón and goats cheese canapé with walnuts and honey. I do not have a single clue about. Sometimes we swap it for Solomillio Pimienta, which is basically the same cut of meat as the one mentioned before but served with something like a Spanish version of Peppercorn sauce. You get fries with both of them. As I said it is not exactly haute-cuisine, but the service is super quick, your food is hot and it’s incredibly cheap. We leave there always between 15 and 20 euro for both and we are stuffed. The montaditos and canapés are one of the best ones in town. Mojo picón sauce is must try in la Linea. One thing I do not recommend in Casa Puri is seafood, it’s really not their speciality. It took us a while to discover these two vibrant places hidden somewhere in the La Linea market place (Mercado La Concepción). This beer bar can definitely offer more than “just” having around 20 different types of beer. They serve cold & hot tapas which is so yummy that you ask yourself how that is even possible in such a small place. It’s very difficult to describe where exactly in the market Ruda is. I’d say it’s on the north side of the market, you just have to enter the market and walk around or just ask somebody for directions (if your Spanish is up to the job). The Mercado is not so big that you’d get lost there. Anyway, it is so full of delicious fruits and fresh veggies, cheese, olives, olive oil, fragrant flowers and a whole lot more that a short walk will definitely not hurt you. Mini Hamburguesa it’s a common Spanish tapa. 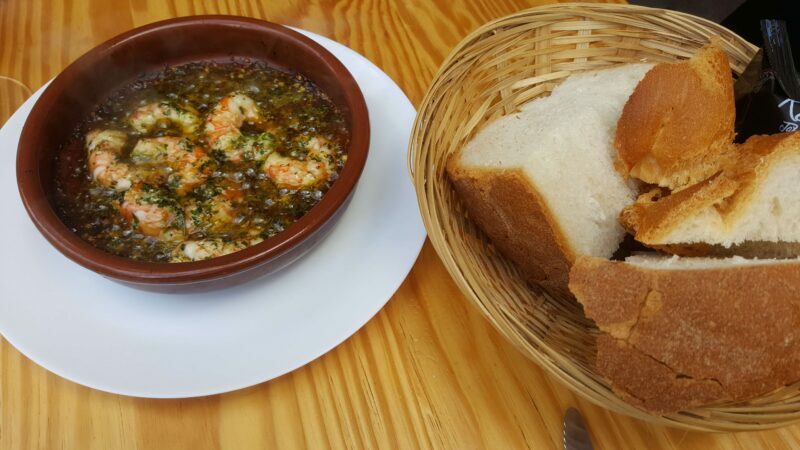 This one is served in La Ruda, a market tapas bar in La Linea. Ruda is basically just a longer bar with a few high chairs dotted around and two standing tables in front of the bar, plus around 3 or 4 seated tables behind the bar. Apart from preparing a typical Andalusian and Spanish tapas, (like croquettes, morcilla, tortilla, ensaladilla rusa, montaditos, cold meat and cheese cuts) they also offer some more non-Andalusian treats like beetroot hummus, pastel de carne (something like meat pastry), nachos with guacamole or gnocchi with Bolognese sauce. They have also daily specials. 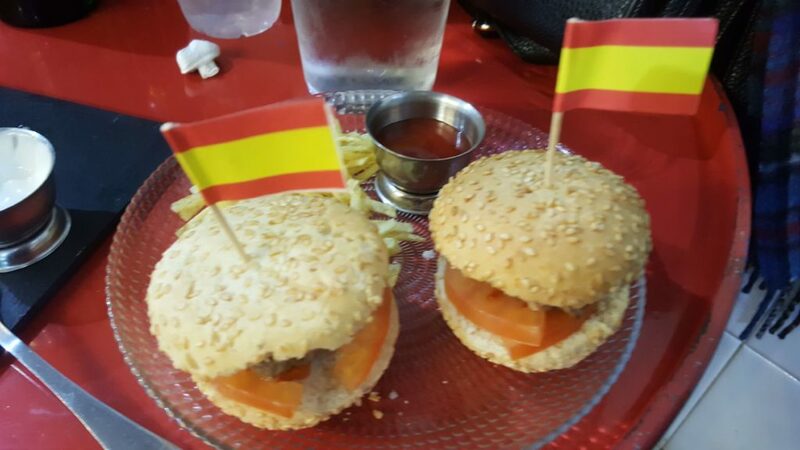 Mini Hamburguesas (Mini Burgers) in town. A soft bun is stuffed with burger meat, caramelised onions with tiny potato crisps on side. So addictive! While La Ruda is a place for beer lovers, La Quesería is a paradise for wine and cheese addicts. It’s the best after shopping routine: just sit down, have a glass of lovely Spanish wine and eat any of the many cheeses they sell. You can also taste different types of montaditos or canapés. The menu is humble but you can observe the preparation of your meal and after that it gets really delightful. Sitting there is always relaxing even if the place is crowded, which it usually is, especially since it’s a tiny stall and there are limited seats available. Some restaurants or bars have huge kitchens full of staff and still can’t prepare better montaditos (bun filled with typical Spanish treats like jamón, pato, manchego cheese and a sauce which is usually gaucha, mojopicón or mayo) than in La Quesería. Visiting Mercado in La Linea and having some small tapas in La Ruda and La Quesería are musts for any visitors to LA. Located at Calle Doctor Villar, Plaza Farinas, Bodebar is definitely one of the most famous restaurants in La Linea. The reason is that they really try to be something more than just a classical tapas bar or a quick fast food restaurant. They try to look fancy, they try to offer fancy food and wine and sometimes they really are fancy (or most of the time). 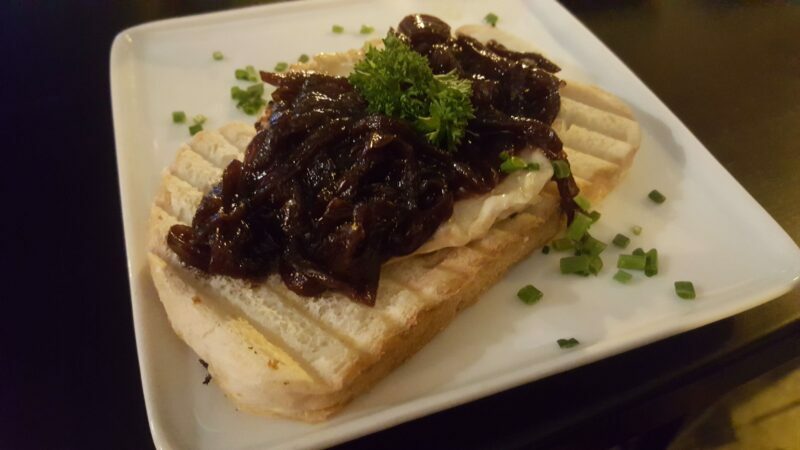 I like Bodebar just as much as most of the people living in or visiting La Linea because it really offers higher quality food and a special selection of dishes for this area. It’s a bit more expensive than other restaurants around but you hardly ever get anything bad. Why don’t I sound so positive about this place? Don’t get me wrong, it’s definitely worth going there and trying different dishes from the lengthy menu, and even vegans could find some specially prepared variations of their meals. The thing is that I’ve already been there so many times and I’ve unfortunately had experience of their bad days over that time and those were a complete disaster. Let’s just mention this one as an example. We arrived at 8pm, half an hour before they take food orders, so we were the second table seated in the restaurant. I do understand that the staff might have been changing at that hour, but as a restaurant staff member you should communicate with your colleagues who are leaving. But they obviously didn’t communicate at all. We were asked to order our dishes at 9:30, when everyone around, all those people on tables which came after us were enjoying or already finishing their plates. We tried to get their attention several times and we also ordered some drinks which arrived 1 hour later. I expect a place which wants to be fancy to be really fancy. I know that Spanish service is many times very relaxing in ‘mañana mañana’ style but if a place sets their standards and prices high they should follow them. Anyway, let’s talk about food. You have plenty of stuff to choose from, at least 10 different salads; our favourite one is the salad with tuna belly, watercress and onion or Ceasar salad served with frozen forest fruits. They have very tasty mini burgers, croquettas, potato tortilla and bread dishes. From bigger plates you should try pulpo – octopus served with cauliflower mash and paprika sauce, the duck fillet or any of the steaks, or flamenquin (something like Gordon blue). The provoleta cheese (barbecued cheese served hot melted) and musaka are delicious as well. Also the grilled veggies platter is delightful, although not as a side dish. After all these treats you should get some lovely dessert. I have tried several desserts in Bodebar but the chocolate sorbet with vanilla ice-cream is the top, the best dessert ever. You can dine here for 15 or 20 euros per person, if you get more drinks it’s a bit pricier. A glass of wine is around 3 euros, and a spirit around 7 or 8 euros. Yeah, it’s a nice place actually. Maybe I should forget about their past service sins… I’ll think about that. I’ll finish this enormous list of my favourite restaurants or tapas bars in La Linea with some foreign cuisine so you can see that in this town you can also have some delicious Korma or Tikka masala. 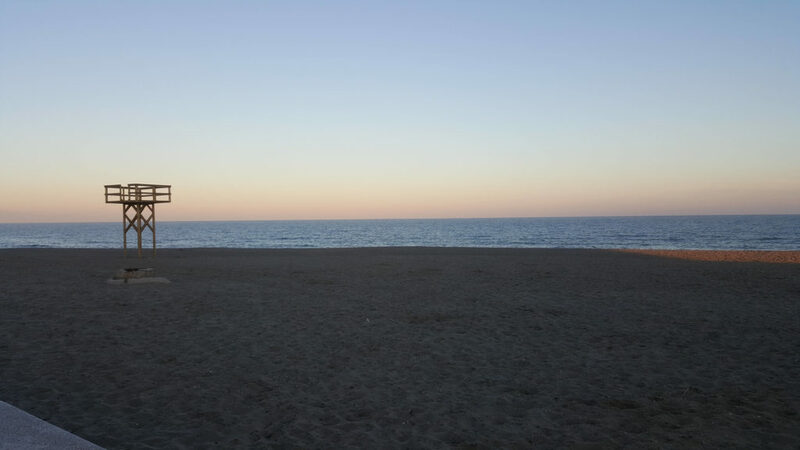 First of all, take a walk along the Levante beach – a.k.a the biggest and also the best beach in La Linea as the real estate agents like to say. It might be covered with some trash but then which beach is clean nowadays? It’s the responsibility of all of us. The sunsets there are stunning but the sunrise sky, even if it’s the East of LA, is unbelievably beautiful too. So take a walk there, watch the blue sea waves and after just a few minutes of walking you get to an Asian restaurant called the Gold Indian. It’s located directly at Paseo Maritimo, 59 and it’s definitely one of the best restaurants in La Linea. Owned and managed by real Indians you get there all the well-known Hindi dishes you know as well as some you probably haven’t heard about. The ambience is pretty exotic too, I don’t really fancy the music myself, but then culture is culture. What I can recommend is basically any starter, plus the papadam bread with sauces is super nice and rich in flavour. Then me and my boyfriend usually go for the onion Bhaji, veggie starter platter or pakora. Gold Indian is by the way one of vegan-friendly places In La Linea and there aren’t really too many of those. They have lots of veggie dishes to choose from and all the naans are lovely too. From the main plates we love Korma, Butter Chicken, Curry, Jallfrezi, Podina and… honestly we love all the dishes, just to make a long story short. If you like (or even if you don’t like) Indian, you have to go there. Don’t confuse this place with another Indian restaurant in La Linea which is called the Golden Palace. It’s definitely a nice place though but slightly worse that the Gold Indian. All the meals from Golden Palace taste almost the same in my opinion. Don’t avoid the place but if you prefer better quality food, go to Gold Indian. The atmosphere there is also much nicer and more authentic. Are These Really the Best Restaurants and Tapas Bars in La Linea? All carnivores can spend hours there! Do you like meat? Yeah? Great, go to La Chacra and get a juicy steak for 10 euros. The steak is served with fries or boiled potatoes and it’s pretty tasty. Many people love it there and I used to love too. Unfortunately, it’s way too salty for my constitution and the day after I feel like I’ve got a hangover (even if I didn’t drink). The place is not for vegetarians, and definitely not for vegans. This one is situated at Calle García Gutiérrez. I’ve been there just once and ordered a pretty weird food selection, though my friends and even my boyfriend claim it’s one of the best places in La Linea. It’s more a restaurant than a tapas place, and they say it’s perfect for romantic dining and main dishes. I like El Rincon, the food is lovely, they even have sushi which is probably the only place in La Linea city centre and they have a huge selection of wines. I have been there 3 times so far and tasted a few dishes. They have lovely mini burgers and Russian salads. I don’t know why but I don’t remember what else I had there and that’s not a good sign. Even though the food is delicious I really miss there something, maybe a specific atmosphere? You go there and tell me. Located at Carrer del Carme, 28. The same owners, almost the same food just the first one is a small tapas bar with bar seating and the second one has more of a restaurant atmosphere (or the other way round). The tapas place is much better in my opinion. Even if both of these places are quite popular, I’ve never fancied them so much. Once I got some super greasy meat in the restaurant and the montaditos there are quite bland too. It might be just about choice, you’re more than welcome to try one or the other – they’re located at Calle San Pablo nº 3. A recently opened tapas bar offering a mixture of Mediterranean cuisine and favourite British tapas dishes or starters such as fish cakes and many others is located at Plaza Cruz Herrera. I really don’t get the google rating of 3 stars from 5. It’s definitely better than that. The Best Takeaway Service in La Linea: Don Domicilio. The Best Kebab in La Linea: Lebanese place at Plaza Constitucion, next to the driving school Autoescuela Rocha Dazu. Are There any Vegan Restaurants in La Linea and Around? I have to disappoint you, dining in La Linea de la Concepcion has to be truly catastrophic for vegans. Andalusian cuisine is everything but vegan! They love meat and seafood. The choice of veggie dishes is very poor, it’s basically just about carne! Even a less strict vegetarian would suffer having a dinner here. You can find a few vegan option though – visit Gold Indian, Bodebar, El Ricnon Wine Bar, or Barbas. Can I dine in La Linea Alone? Definitely. You know that you can dine solo everywhere you want. And it’s not sad at all. Before I met my boyfriend I used to go almost everywhere in La Linea on my own. I was new in town, didn’t know many people and I also love being alone so I just went for a coffee and breakfast to any random place and I spent hours there just sipping my drink and reading books. Spaniards, especially Andalusians are cool and relaxing, sometimes it borders on ignorance but at the end of the day it’s a good trait. Nobody judges you and even though people are mostly sociable and hanging around with their family and friends, nobody will give you any strange looks; instead, they’ll probably start a conversation with you. And it’s safe. In most parts of town, at least. The city centre is usually full of people, I’d just avoid crossing the Princesa Sofia park during the night and hanging about on any of the beaches after dark. Otherwise you won’t have to worry. What Are Your Favourite Restaurants in La Linea? Don’t agree with the best tapas bars & restaurants selection? Comment below with the places you like the most in La Linea and around. Thank you! Do you love Spanish food or do you want to explore more? read about yummy Spanish snack in this article about tapas to die for.